Bee Venom Therapy is a controversial alternative treatment used by some patients with Lyme disease. 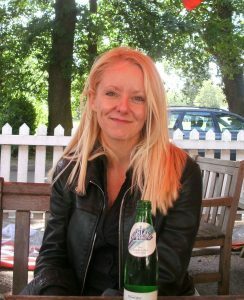 Lyme Disease UK doesn’t endorse any particular treatment and any opinion stated in our guest blog is that of the author. Do not attempt self treatment without precautionary measures and oversight by a medical professional. I started to feel unwell in the winter of 1999 after a tick bite the previous summer. I remember the bite and the bullseye but not what the doctor said, only that it wasn’t anything to worry about. In hindsight, I don’t know why I believed that. I had spent a good deal of my childhood in Germany and I knew about Lyme disease; I grew up hearing the stories of Lyme carditis, arthritis and cognitive decline. Perhaps I just assumed I’d be all right, I was incredibly fit, a competitive swimmer and I felt invincible. I wasn’t. My mum had died of brain cancer the year before and as I’d nursed her whilst working to finance my degree, and took on my mother’s responsibilities, I had cancer myself and my fiancé had been deported, I put my increasing levels of fatigue down to stress and overwork. In the April of 2000 I started to deteriorate rapidly. I had visual disturbances; my hearing was distorting; I kept passing out and developed vertigo; my heart palpated; blood pressure dropped and my pulse raised (it had been around 50 bpm and was in excess of 270 constantly- it stayed there for ten years); my joints, especially my knees were agony; I couldn’t keep food down and my bowels wouldn’t move no matter what I did or took; my white blood cell count was dropping; my temperature was dropping; and most alarmingly of all I was losing words, spatial awareness and the ability to understand even simple instructions. I was diagnosed with M.E and told to exercise more; at this point I couldn’t stand. I developed sores all over my legs and body that wouldn’t heal and unexplained rashes everywhere. I started to gain weight, rapidly. All the consequent consultant and GP visits led nowhere and I narrowly escaped being sectioned. By the June of 2000 I couldn’t read, write, walk or hold a conversation. I crawled to the bathroom and remained bedbound for the best part of eleven years and housebound for the next three. I improved in as much as I taught myself to read and write again, to walk and function at a very low level. But I kept relapsing. I caught infection after infection, each one more serious. Long story short- I met my partner online and his health insurance paid for a Lyme test. It was positive. And there was absolutely no money whatsoever to treat. I hadn’t been getting sickness benefits until I met my partner, Lee as I couldn’t fill the forms in and had been living on the bare minimum of income support and was in debt. I didn’t have any savings. Nor did my partner. I knew I had Lyme, I wanted to treat it and I couldn’t afford any of the options. That’s when I read about Ellie Lobel’s story and Dr Klinghardt’s success with bee venom and started considering Bee Venom Therapy. It has anti microbial effects proven to be effective against the Lyme disease bacteria. I didn’t like the idea of killing bees and I didn’t know who to get bees to sting with in the first place (I wasn’t well enough to start my own hive). I couldn’t get to the only bee venom therapy course in the UK or even contemplate managing a full day out of the house. So I approached my local BKA and to begin with, they supplied the bees so that I could begin the protocol endorsed by Ellie Lobel. I wasn’t consulting a private doctor at this point and my GP was not supportive, with the Lyme diagnosis or any kind of treatment. In fact, they consider what I’m doing to be self-harming with live bees. I have the distinct impression they’d like to lock me up. The initial test sting was hard. I’m allergic to bees and have histamine intolerance, so the possibility of going into anaphylaxis was relatively high. My throat did become tight and I had difficulty breathing for a few minutes. Slightly scary, more so for Lee. I was almost beyond caring, I’d reached the point of last resort and no return. I had the precautionary alcohol free Benadryl on one side and EpiPen’s on the other (you can’t begin bee venom therapy without them). Lee had been primed to tip the Benadryl down my throat and then inject me if anything went wrong. It didn’t. I was fine. I herxed like crazy that night- sweats, shaking, nausea and dizziness, but no anaphylaxis. After the test sting, providing all goes well, you place two stings on either side of the spine and leave them in for a total of twenty minutes. If that’s tolerated, you increase the number of stings at a rate that suits you until a maximum of ten stings is reached. Always along the spine to begin with. Some people can build up quickly and easily, others struggle tremendously. Those with the MTHFR gene mutation should build up very slowly. I’ve been at the full ten stings for almost two years now. 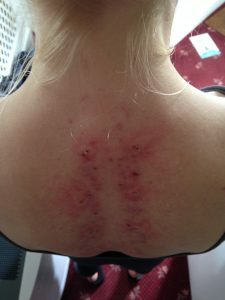 I sting away from the spine on occasion, the knees and elbows, head and neck for example, various acupuncture points– but not too often, it’s not thought necessary under Ellie’s protocol. There are other protocols out there, Dr Klinghardt’s among them, and they all have their pluses and minuses. Regardless of the protocol, it’s imperative to keep your phone, EpiPen’s and Benadryl with you at all times. High levels of vitamin C and magnesium are required and you need to be prepared to detox like crazy on the non-sting days. There are certain supplements/herbs and teas which will impair bee venom therapy and ideally need to be avoided. Alcohol negates venom and must be avoided. The various protocols and do’s and don’ts are included in the file sections of the various U.S bee venom forums. The forums provide a wealth of information and are incredibly supportive and helpful, I couldn’t have done it without them. For some, the improvements are rapid and they are near recovered in a year or even less. For others, a two-year protocol is sufficient. Some will need to address other issues alongside the Lyme in order for the bee venom therapy to work effectively. I think the speed of recovery depends on so many things- genetics, detox pathway blockages, the length of time undiagnosed and untreated, other treatments tried before hand and the level of killing already accomplished. Ones living environment and stressors, the possibility of mold and oral cavitations, and metal toxicity. The overall health of the gut, the possibility of SIBO, potential leaky gut, borellia in the gut creating poor microbiome and peristalsis and therefore poor detoxification and absorption of nutrients. The quality of supplementation that can be afforded by the individual- the list goes on; it’s definitely not a one size fits all. Bee venom will address some of these issues, but not all and not in everyone’s case. Our bodies are unique after all. When I ask those closest to me if I’ve improved they are more enthusiastic than I am. Being in the midst of it, I feel it could be faster; I’d quite like to have been better about seventeen years ago! However, generally, my energy is better and is relatively stable. I’m able to socialise again – in a limited capacity, but I’m leaving the house on a regular basis. My vision has improved and the dizziness has almost gone. Cognitively I’ve improved dramatically. I couldn’t have written this prior to bee venom therapy. The level of exercise (yoga) that I can manage daily has tripled and I managed to complete a yoga teacher training course last year. My response to stress has improved, I almost respond normally again; the adrenaline doesn’t kick in and knock me off balance for days or weeks anymore. I feel safe inside my body again, more like me, less like an invaded, overwhelmed host. My personality is returning, I’m sarcastic again (did not have the energy for that for years.) My blood pressure and pulse are normal. I’m hungry, all the time, which is wonderful, I didn’t have an appetite at all really until I started bee venom therapy. And my sleep has improved, tremendously. But I’m not recovered yet. My immune system and gut are still causing issues. My brain is still inflamed as far as I can tell (can’t afford to have any testing and my GP is not willing to help) and the minute I catch an infection the cytokines trigger all the old symptoms. Mold and/or oral cavitations may have to be addressed. I still have a way to go, but I’ve come a long way too, especially as I was bitten again last year and developed the Erythema Migrans rash. I took antibiotics alongside the BVT (which you can do, although the general ethos is that less is more) and think I’m back on track. The herxing is hard (as it is with most killers), and I’ve had the crushing depression, elation, nausea, neuropathy, pain, emotional and physical retracing in cycles the whole way through. Bee venom therapy is not for the faint hearted, but then neither is Lyme.